I had a big pile of submissions in the mailbox the day Jupiter Jefferson's CD arrived. But my eye quickly zeroed in on the Transit Rd in Amherst, New York address, which is just minutes from where I grew up. Jupiter Jefferson is a trio consisting of Michael Farry on drums, Sandor Stawicki on bass and Aaron Armstrong on guitars and vocals. This is their second album. The CD opens with "Ice House", a molten ripping psychedelic Stoner rock song. I like Stawicki's bass which lays down a nice stoned thudding pace, but is more rockin than sludgy. And Armstrong goes into total acidic heaven for much of this 6+ minute song. "Corner Room" is more of a regular rock song, but with Armstrong doing his freakout thing in the background. It's an interesting effect hearing the song element... the vocals and rhythm section are actually pretty radio friendly... but backing the music are grunge guitar chords and oodles of psychedelic angst. "Never" is less psychedelic but definitely spaced, the wall of guitars reminding me of some Farflung songs. Powerful stuff indeed. "Freezing" is a highlight track that begins with a Sabbath styled stoner bass riff that drifts along for a minute or so, slowly building in power until the full rockin acid-psych fury of the band kicks in. But it's only a brief teaser... the guitars recede and the process starts again. But this time when the band launches we're in full jam mode and in fact get treated to some of Armstrong's most melodic guitar moments on the album, though we're still rockin hard and get assaulted with plenty of the hard grinding acid guitars that seem to be integral to the Jupiter Jefferson sound. "Mountain" is a bit different, mostly due to do the acoustic guitar. But it's a solid tune with a nice combination of acoustic guitar and electric guitar melody line. "Gargantuan" wraps up the album and includes more acoustic guitar but is heavier rockin than "Mountain". And at over 8 minutes the music jams along at a lazy floating pace as the acoustic guitar strums and Armstrong's fuzz guitar lays down a pleasant melody. The band do a good job of being simultaneously power rocking and trippy, and along with the jam we get a decent melodic song too. In summary, I enjoyed the whole album but Jupiter Jefferson are at their best when cranking out acid stoner assaults. They do a damn fine job of tripping out but doing so while backing more structured songs. I like the combination. And I'll bet their live shows are exciting too as the promo sheet mentions liquid light shows and 16mm projectors. Tasty! 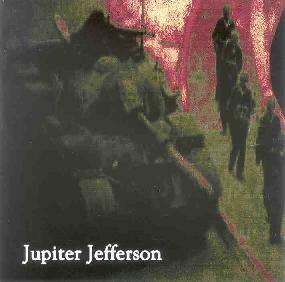 For more information you can visit the Jupiter Jefferson web site at: http://www.jupiterjefferson.com.